It was September 2016, my buddy, Van, was about to get married in a couple of weeks. We decided to go on a camping trip to celebrate. He lives in Iowa and I live in Texas, so we decided to meet in the Ozarks, which was almost exactly halfway between us. I think Van would agree with me, Big Piney Creek is one of those rivers that you could float over and over again without getting sick of it. Granted, I think we hit the river when the conditions were just right. If the water had been lower, we would have had to carry the raft for 7 miles. If the river had been higher, this novice oarsman would have been a little sketched-out. According to the USGS stream gauge at Dover, AR, the river was flowing at about 100 cfs and the gauge height was about 1.1 ft high. So, by looking at flow rates a month before and after our float, it looks like we hit the river at a great time just by sheer luck. We dropped Van’s truck off at the end of Forest Road 1802. 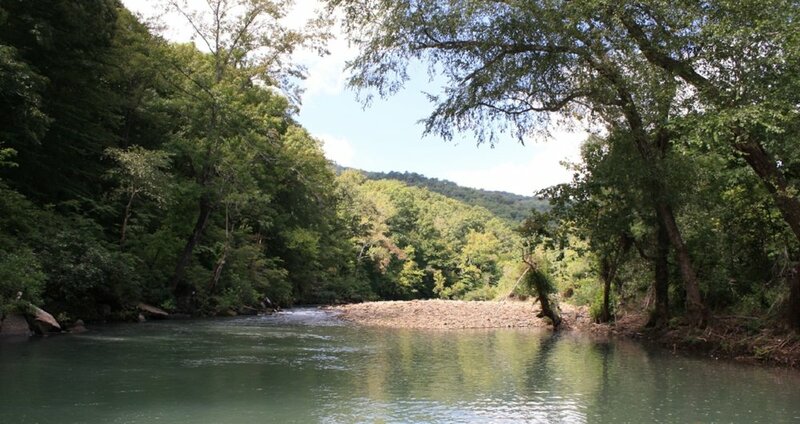 We then launched the Flycraft close to Haw Creek Falls, where RT 123 crosses Big Piney Creek. I estimated the float to be around 7 miles. Shortly after we shoved off the bank, it became apparent that this river was going to make us work for our fun. There were plenty of long shallow sections where we couldn’t float the Flycraft through, we had to hop out of the raft and pushing/lifting the raft over the many rock gardens. Yes, this was a little bit of work, but it made the trip that much more rewarding. We didn’t see a single person out on the river with us. It was just us, the dog, and the many Smallmouth that we were catching. The fishing was great for the whole float. We both were using conventional fishing gear and it seemed like the many Smallmouth Bass and Green Sunfish really keyed in on the jointed shads, made by Rapala. The Green Sunfish were very nice sized. Many of the Smallmouth were fairly small, but quite abundant. We managed to catch a very decent Largemouth by using a deeper-diving Rapala. The Largemouth was hooked along a steep embankment where beaver had several holes and food trays along the banks. By the time we got to our take-out point, the sun was starting to fade over the surrounding mountains. The evening light cast a shadow over the river valley. Both of us were ready to get off the water and head back to camp, which we still needed to pitch. It was a great day to explore a new river in an area that both Van and I have grown to love. Below is a Google Maps Photosphere that was taken at the take-out-point along Big Piney Creek. Click and drag around on the image to see a 360 degree photo!